Quieter than a whisper, less power-hungry than a mechanical drive, able to leap off your tabletop while running and probably survive. Look in My Computer: it's . . . well, it looks like an ordinary hard drive, doesn't it? Far from ordinary, though, this 32 GB solid state hard drive Transcends its electro-mechanical counterparts. Using the standard 2.5 inch form factor and the common IDE (ATA) interface, it looks like a meek mild-mannered hard drive, but having no moving parts, it is shock resistant to an unprecedented degree, and is not "virtually silent", it IS silent. Smaller power requirements mean less heat generated and longer battery life. Whether you like using your laptop while jouncing across the veldt on safari or you just don't want your five year old to break the drive again, this may very well be the drive for you. We'll wait right here while you decide for yourself. SSD Storage Technology Acting without any moving parts, the Transcend TS32GSSD25-M solid state drive (SSD) boasts multiple advanced features including zero mechanical noise, faster data rates compared to conventional HDDs, over 3.6-million-hour life span, ultra-low power consumption and impressive shock, vibration and extreme temperature resistance. With these breakthrough capabilities, the SSD meets all the demanding requirements for high-performance mobile computing. 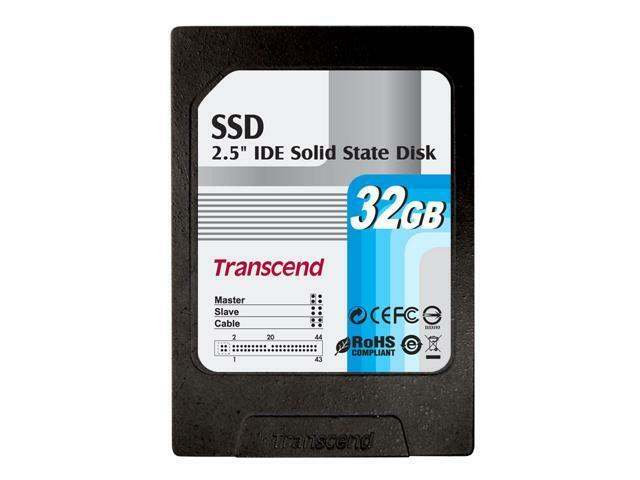 2.5" Form Factor The Transcend TS32GSSD25-M solid state drive is specifically designed for notebook computers equipped with a 2.5" IDE drive bay. Pros: Reasonably fast, quiet, affordable, and perfect for my embedded system. Don't quite understand the speed complaints as I installed XPe (basically XP Pro without the fluff like messenger and WMP) in less than 15 min an get from XPe starting screen to desktop in 7 seconds. Post screen to desktop is 12 seconds. As mine will be going into a special application and boot up will happen only 5-6 times a year the telling will be in the longevity not speed. See "other thoughts below". Other Thoughts: Bought 7 of these things for a PC based controls project in an extreme environment. High heat, high moisture, dust and oil condensate (sluge) are all on the menu where these things will be living. My proof of concept has this drives baby brother (8Gb model) installed and has gone over a year with no documented crashes and less than 10 hours off (as in continuously running for almost 10,000 hours) with no issues whatsoever. The idea is to get the prone to failure HDD's out of service and put these in place. Hopefully these 32Gb drives will be as durable as the 8. Pros: For me, this drive worked really well in my Nomad Zen Xtra MP3 player. I bang this player up really bad since I use it at work all the time, and I'm constantly having hard drives go bad due to me dropping the player or bumping it at just the wrong moment. I was able to install this drive, and load my music into the zen player, and listen to MP3's just fine. Cons: As expected, it took longer than usual to load the music into the player. This drive would certainly not be suitable as a main drive for a OS, but it is useful as a drive to backup your data, or in my case, to put into a MP3 player that uses the 2.5" form factor HD. Other Thoughts: I bought 10 of these at various prices as Newegg didn't have enough. The price was dropping very quickly as Newegg realized how bad they are. They should have taken off the market. Cons: The drive is so slow that it is useless for most computing tasks. I built a computer using Intel Little Valley MB and 1GB of RAM. Vista Home OS took about 5hours to install. Any window I want to open takes several seconds at minimum. Other Thoughts: I do not reccomand this drive for any PC project. Its way too slow for any type computing that involves human input. Cons: Running on an Asus P5N-3 SLI, I see it in the device manager under disk drives, but no secondary disk storage device in my computer. Wish I bought the @($%* thing on Newegg so I can send this garbage back. Other Thoughts: Think this will work on the bottom 5% of motherboards...dont even bother with this thing. Cons: Extremely slow to the point of being ususable with Windows. Perhaps a DOS machine would be a better environment. Pros: Completely silent, good seek time. It should be reliable (no problems yet, but that doesn't mean much). Cons: Very slow write speed, and slow sustained read speed. Other Thoughts: I wanted a completely silent computer, so I bought this, which was the cheapest 32GB SSD at the time. I don't regret it, but if you are looking for high performance, look elsewhere. The fast seek time makes up somewhat for the slow read speed, but when writing a lot, it is much slower than a traditional hdd. The disk seems to have a buffer which fills up quickly, so when writing a large file, my computer is completely unresponsive for intervals of several seconds. 31 out of 32 people found this review helpful. Did you?